The Vympel R-73 (NATO reporting name AA-11 Archer) is a short-range air-to-air missile developed by Vympel NPO that entered service in 1984. The R-73 was developed to replace the earlier R-60 (AA-8 'Aphid') weapon for short-range use by Soviet fighter aircraft. Work began in 1973, and the first missiles entered service in 1984. The R-73 is an infrared homing (heat-seeking) missile with a sensitive, cryogenic cooled seeker with a substantial "off-boresight" capability: the seeker can "see" targets up to 40° off the missile's centerline. It can be targeted by a helmet-mounted sight (HMS) allowing pilots to designate targets by looking at them. Minimum engagement range is about 300 meters, with maximum aerodynamic range of nearly 30 km (19 mi) at altitude. The weapon is used by the MiG-29, MiG-31, Su-27/33, Su-34 and Su-35, and can be carried by newer versions of the MiG-21, MiG-23, Sukhoi Su-24, and Su-25 aircraft. India is looking to use the missile on their HAL Tejas. It can also be carried by Russian attack helicopters, including the Mil Mi-24, Mil Mi-28, and Kamov Ka-50/52. From 1994, the R-73 has been upgraded in production to the R-73M standard, which entered CIS service in 1997. The R-73M has greater range and a wider seeker angle (to 60° off-boresight), as well as improved IRCCM (Infrared Counter-Counter-Measures). Further developments include the R-74 (izdeliye 740) and its export variant RVV-MD. Russia currently receives new improved air-to-air missiles on the basis of the R-73. An improved version of the R-74, the K-74M (izdeliye 750) features fully digital and re-programmable systems, and is intended for use on the MiG-35 or MiG-29K/M/M2 and Su-27SM, Su-30MK and Su-35S. A further upgrade, known as the K-74M2 (izdeliye 760), is intended for the fifth-generation Sukhoi Su-57 aircraft. This missile has reduced cross section to fit in internal weapon bays and will match the performance of the AIM-9X and the ASRAAM. A clean sheet design, the K-MD (izdeliye 300), will supersede the K-74M2 in the future. On 24 February 1996, two Cessna 337s of the Brothers to the Rescue were shot down while flying over international waters 10 nautical miles outside of Cuban airspace by a Cuban Air Force MiG-29UB. Each of the aircraft was downed by an R-73 missile. 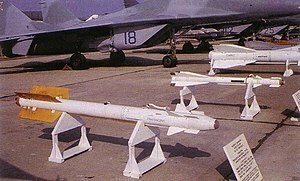 During the Eritrean-Ethiopian War from May 1998 to June 2000, R-73 missiles were used in combat by both Ethiopian Su-27s and Eritrean MiG-29s. It was the IR-homing R-60 and the R-73 that were used in all but two of the kills. On 18 March 2008, a MiG-29 Fulcrum of the Russian Air Force intercepted a Georgian Elbit Hermes 450 UAV over Abkhazia. The MiG-29 destroyed the UAV with an R-73 missile. On 27th February 2019, during the 2019 India–Pakistan standoff, an Indian MiG-21 carrying two R-77s and two R-73s was shot down in a controversial confrontation by a Pakistani Air Force jet, where India claims the MiG shot down a Pakistani F-16 before being shot down itself. Pakistan showed the wrecks of all four air to air missiles carried by the MiG to prove that none of them was fired. India insists that one of the R-73s was fired downing an F-16. Pakistan and most of the Western sources dismessed the claim. R-73 - Standard model with ±45° off-boresight. R-73E - Export version of the standard model. R-74 (izdeliye 740) - Improved model with ±60° off-boresight. RVV-MD - Export model of the R-74. K-74M (izdeliye 750) - Improved model with ±75° off-boresight. K-74M2 (izdeliye 760) - Further improved variant with reduced cross-section for the Sukhoi Su-57. Intended to match the AIM-9X and ASRAAM. Georgia Used on Su-25KM Scorpion. 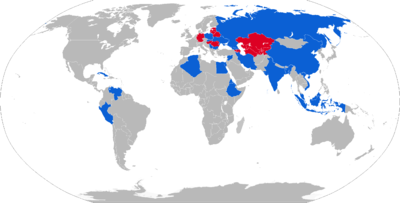 Soviet Union Passed to successor states. R-73Ae, R-27R1(AeR1), R-27T1(AeT1) and Kh-59MAe at 1999 MAKS (air show). ^ "Tactical Missiles Corporation JSC". Retrieved 10 September 2016. ^ "AA-11 ARCHER R-73". Retrieved 23 December 2014. ^ "Tactical Missiles Corporation JSC". Retrieved 23 December 2014. ^ Reed Business Information Limited. "Vympel reveals previously classified air-to-air missiles". Retrieved 23 December 2014. ^ Sputnik. "Russian Military Receiving New Improved Combat Air-to-Air Missiles". Retrieved 10 September 2016. ^ Butowski, Piotr. Russia and CIS Observer. 17 June 2007. ^ University of Minnesota Human Rights Library (1999). "Armando Alejandre Jr., Carlos Costa, Mario de la Pena y Pablo Morales v. Republica de Cuba, Case 11.589, Report No. 86/99, OEA/Ser.L/V/II.106 Doc. 3 rev. at 586 (1999)". Retrieved 1 April 2019. ^ "Cuba11.589". Retrieved 10 September 2016. ^ "Russian jet shoots Georgian drone © Reuters". YouTube. Retrieved 23 December 2014. ^ "Weapon". Retrieved 23 December 2014. ^ "Bangladesh Military Forces - BDMilitary.com". Bangladesh Military Forces - BDMilitary.com. Retrieved 23 December 2014. ^ "Su-25KM SCORPION (It is made in Georgia)". YouTube. Retrieved 23 December 2014. Wikimedia Commons has media related to Vympel R-73. This page was last edited on 22 April 2019, at 10:20 (UTC).